In Fat Facts, the last in our Body Composition series, we guide you through the good fat, bad fat confusion. As with most things in life, knowledge is power, so equipping ourselves with some essential fat facts helps us take control. When it comes to our own health, knowing our own bodies so we can take control has to be the best starting point. So far in this series, we’ve looked at Body Composition and ways of measuring the proportion of fat, muscle and bone. By far the most accurate and consistent way to measure the percentages of visceral and subcutaneous fat in your body is with a DEXA scan. 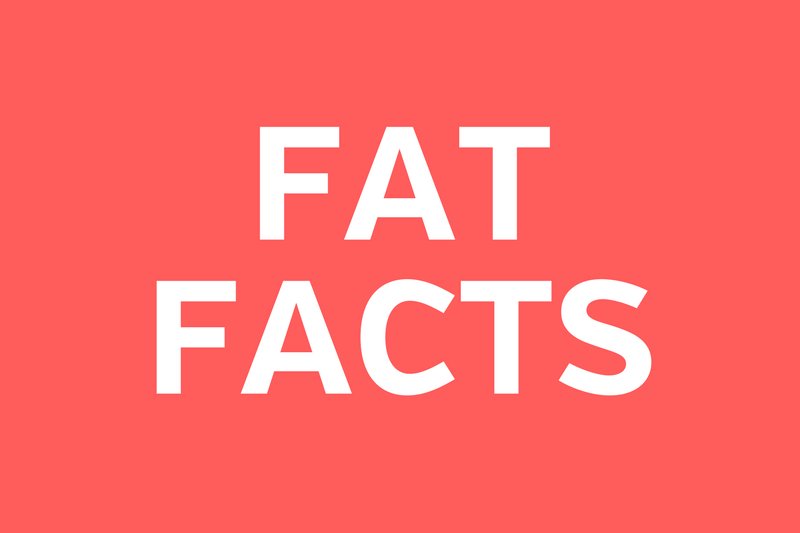 Before deciding whether or not you want or need to reduce fat levels and from where, we’d like to equip you with some more fat facts. guidelines on what is deemed healthy or excessive and this differs according to age and gender. Whether you are male or female influences both where you store fat and how much fat you need to remain healthy. Also decisions as to what you do will depend upon your health and/or if your sporting or daily performance of tasks would be made easier by losing some fat mass. Or, you may just want to be leaner for personal preference. Fat isn’t bad, it’s essential. We need some fat to stay healthy and allow our bodies to function optimally. Fat has a vital role in energy storage, cell integrity, insulation and protecting us from impact injuries. It literally cushions the soft tissue around the major organs. In the sporting arena, there are sports where extra fat levels do no harm to performance and can even play a key role in beating an opponent, such as strongman, highland games and sumo-wrestling. That is not to say, however, that increasing muscle isn’t more desirable! is slower than from a stored or consumed carbohydrate. As a result, force outputs ie. productivity, could be lower. Before we look at whether or not it’s a good idea to lose any fat mass, let’s consider the types of fat we carry. The type of fat we carry is also of huge importance. Fat cells (adipocytes) fall into two main groups, white and brown. The difference lies in what the colour means from a cellular and metabolic level. The existence of beige fat cells suggests a ‘browning’ effect and the possibility of change within the cell function (cellular plasticity). White adipocytes have lower metabolic properties, are harder to access as an energy source and are shown to be more harmful long term. Comparatively, brown adipocytes are much more metabolically active, an easier to access energy source and can be protective against extreme cold. Beige fat tends to show up when white adipocytes are becoming more like brown adipocytes – a browning effect which has been shown to occur after exercise. For some time, we have known that exercise induces increased metabolism even beyond the calories used for the work out itself. Part of the mechanism behind this is thought to be the enhancement of brown (metabolically active) fat cells and ‘browning’ of the white cells. Fat itself is a strange type of tissue. Adipocytes are essentially a “balloon of triglycerides” and once that balloon has been made by the body, we can fill it, empty it, fill it again and so on. BUT the one thing we don’t appear to do is ever really get rid of the cell itself. That’s right, a fat cell is for life. Think about that for a moment. We cannot (without medical intervention) get rid of fat cells permanently. What we can do is use the fuel ie. empty the cell. So, how and what happens to it? Do we ‘burn it’? We use fat in a process called oxidation. We cannot simply ‘turn fat into muscle’ or even literally ‘burn’ fat into energy. What really happens is that the triglycerides (made up of carbon, hydrogen and oxygen) are released from the fat cells by hormonal signals and converted to glyceride and fatty acids by a process called lipolysis. The glycerides are processed by the liver and the fatty acids are transported to muscles via the blood stream for use within our mitochondria. It is here that the chemical components are separated for energy release. The constituent parts are then excreted as carbon-dioxide (~84%) and water (~16%) ie. our breath and sweat during exercise. This complex system is working continuously, especially when we are in an energy deficit ie. consuming fewer calories than we are using, for example during physical activity. In other words, exercise can increase the rate of fat oxidation even beyond the duration of the exertion itself. Building muscle is an entirely separate process requiring a different stimulus within the body. Rest assured, PerformancePro will cover that subject too in the months to come. So although losing fat (emptying the fat cells) and building muscle are two processes that can happen side by side, careful distinction between the two must be made. To recap on fat facts so far. Fat isn’t all bad. We need it, can use it and sometimes it protects us. Too much, however, can be dangerous but too much depends upon the type of fat, where it is and on our age, gender and day to day activity. It’s important to know where the danger line is for you as an individual and how close you are to it. A good first step is to get a DEXA scan. Then, armed with the results, the next step is to make a call on whether you need to reduce fat levels and where to improve your health, fitness and performance. The quickest and arguably most important way to make someone faster, jump higher, stronger relative to body weight and more metabolically efficient is to lose some excess fat mass. Fat has no contractile or movement ability and so carrying more than is essential can make athletes slower and weaker (relative to their total mass) than their potential. The PerformancePro team has now worked with several clients who have been to our partners Bodyscan. As you’ll know from our Body Composition series, Bodyscan use DEXA scan. This not only provides our clients with an accurate picture of their true body composition, it also gives focus and drives motivation. It also directly informs individual goal setting and helps validate the work done with the PerformancePro team to achieve those goals. Finally and essentially, input from Bodyscan provides a very powerful overview of overall health. For a coach, it’s really important to know what is working best for each individual client, so it’s great to get confirmation that the work we do is having both visible and internal effects. Getting accurate and consistent measurements of a client’s body fat over time makes a real difference. Of course, we love to see a client getting stronger and fitter, that’s why we do what we do. But when we know they are also healthier and at lower risk of disease, it is even more rewarding. In part 1 of PerformancePro’s Body Composition series we mention the F word, with the truth, myths and challenges in measuring our body fat levels. Then we meet Bodyscan, PerformancePro partner and the UK’s leading authority on the use of DEXA X-ray technology to measure body fat composition. Boström, P., Wu, J., Jedrychowski, M. P., Korde, A., Ye, L., Lo, J. C., … & Kajimura, S. (2012). A PGC1-α-dependent myokine that drives brown-fat-like development of white fat and thermogenesis. Nature, 481(7382), 463. Cohen, P., & Spiegelman, B. M. (2015). Brown and beige fat: molecular partsof a thermogenic machine. Diabetes, 64(7), 2346-2351. Garretson, J. T., Szymanski, L. A., Schwartz, G. J., Xue, B., Ryu, V., & Bartness, T. J. (2016). Lipolysis sensation by white fat afferent nerves triggers brown fat thermogenesis. Molecular metabolism, 5(8), 626-634. Sepa-Kishi, D. M., & Ceddia, R. B. (2016). Exercise-mediated effects on white and brown adipose tissue plasticity and metabolism. Exercise and sport sciences reviews, 44(1), 37-44. Stanford, K. I., Middelbeek, R. J., & Goodyear, L. J. (2015). Exercise effects on white adipose tissue: beiging and metabolic adaptations. Diabetes, 64(7), 2361-2368.